"A little phrase that says a lot about your personality"
Because when you say I have a Marantz you are reporting ot applicable a person who has very specific tastes and requires that there are better. And you do not think first in terms of money, but in terms of value, quality. A quality that meets your requirements ... Because, of course, as your house, your clothes or the music you love, your stereo expresses what you are: an individualist, who refuses to compromise, sure his tastes, his judgment. MARANTZ offers a full range of appliances. Each has its own characteristics, its own qualities. No doubt you will find among them one that fits exactly your desires. Are you ready for a Marantz... And Marantz is available. WHY HIFI STEREO MADE ELEMENTS? Ask the electronic engineer , the buff "Sound System", the musician, the chanteur. Tous will tell you that they prefer the stereo system that combines the excellence of its technical quality and flexibility . Hence their choice of a stereo system composed of separate elements. If they opt for a so often is that Marantz Marantz stands professionnalisme.Every Marantz element is designed to exceed the professional standards ... Marantz are not so far reserved for purists. Anyone looking that there are better and have interest in adopting stereo stereo composed of separate elements. First, because this is the most adaptable system. You build it according to your taste of the moment. Each element is a separate entity , it is always possible to select the tuner that you like the most and combine it with the best suited to your needs amplifier. This flexibility in the choice of elements is not one of the least attractive Marantz products . Marantz each element is designed to perform a specific function, you get optimal performance. And maintenance and repair costs are lower. You want to improve your stereo? No need for all that, replace all, you can always proceed element by element. With Marantz, everything is possible! This is the same as the M-510. We do have him removed as VU meters and their corresponding circuits. With this, you do not save a lot of money without sacrificing any of the exceptional quality basic 510-M, we left indicators obviously overload!. To know exceeded limits, but there are circuit protection anyway, same performance, same power; 256 Watts RMS per channel at 8 ohms from 20 to 20,000 Hz and without pius 0.1% total harmonic distortion (THD) ... Even precision in construction and, especially, in the end circuitry receiving the tunnel cooler . You also get gain controls left and right. In short, if you are an amateur and a little tighter budget point of view ... so buy the Marantz Model 510 (without the "M"). We guarantee a professional listening without remorse! 250 Watts continuous power everything you need and more to make a nice little "Jam Session's" house. The 250 is a rugged amp that you give a stereo sound ever met, lively, professional. It is also a very versatile amp, who performs wonders for both the control studio for very high power applications and special users. Usually 250 provides up to 300 Watts of continuous power into 8 ohms from 20 Hz to 20 kHz with less than 0.1 % THD . Another feature specific to seduce professionals: it is illuminated VU meters showing output level. Their fontion is to identify visuellemenl while allowing inspection of the actual power that reaches the speakers, thus avoiding the saturation of the amplifier and / or the input stage amplifiers. Control "meter range" provides a maximum deflection of the needle even at low output levels. The 250 amp that gives you more in terms of price. In terms of technical improvements and power, enjoy! No bluff. Some performance. It is the M-510 model. With 256 Watts RMS maximum per channel, 8 ohms, 20 to 20,000 Hz and not more than 0.1 % total harmonic distortion ( THO ) ... 510-M model is actually an exceptionally powerful device capable quality of sound systems in the harshest conditions. And talk about reliability. Two exclusive solutions ensure it is the most reliable amplifier Marantz ever produced. First, an exclusive terminal amplification circuitry spot, channel, a stack of eight output devices 200 Watts. Which is not less than capacity dissipation 3200 Watts! This means that the M-510 has the largest SAFE OPERATING AREA (SOA) ever included in a power amplifier of this class. Secondly, the output devices are mounted in a cooling tunnel designed by Marantz. Every output transistor is mounted on a heat sink quite independent, each having extended into the famous tunnel where a swirling air flow significantly increases the cooling fins. actually, due to more 500 percent! 510-M will never be subject to extreme temperatures, thus ensuring thereby a high quality performance and reliability for many years,levels of output control are dual-use. All of first, they show the power level actually directed to the speakers, then they show the balance of left and right levels to determine the best stereo reproduction. The device is also equipped with a Range Meter allowing leclure 0 dB , +10 dB , +20 dB: the deflection of the needle is maximum even at low output levels. There is also an overload indicator to show that the VU meters can not tell you. Gain control left and right is also on the M-510 model. Finally, the model 510-M is unconditionally stable, even if highly reactive load as this occurs with electrostatic type speakers. In short, whatever your needs, consider the Marantz Model 510-M. This is the most famous and safest power amplifiers. 240 is harmonious, sure, but that's not all. By its power without failure, the care taken in its construction, its remarkable reliability, 240 looks like a twin brother to the Marantz 250 minus 2 Performance Indicators illuminated and technical improvements are absolutely identical to those of the 250 system "Variable Overlap Drive" automatically compensates for normal wear components: the sound of the 240 will always be "like new" and the 240 offers total stability, regardless of the load, massive coolers and more. Continuous power of 250 watts on 8 ohm speakers (usually 300) from 20 Hz to 20 kHz. Distortion: less than 0.1%. All the virtues of Marantz 250 with an advantage over the price. Are you considering buying a stereo power amplifier? Think 240. This we listen with your eyes closed. Less time to spend with controls, but just as much fun to listen to quality music, Behold defined Marantz Model 3600 compared to 3800 Model It also has all the controls sliders pads for low, medium and high . . These sliders allow quick adjustment and fine tones. High and low filters separately correct sounds high and low frequencies tape hiss and rumble turntables. The Model 3600 allows a variation of volume balance between the left and right channels. tolale the harmonic and intermodulation distortion are listed respectively in a maximum of 0.02 % and 0.01 %. The frequency response is absolutely flat from 20 to 20,000 Hz even at very high output levels. All the music, no noise , except for the "big brother", the 3800 model, there is no other product on the market that alligne a level above 100 DB dynamic. The monitoring circuit is provided for the connection of two recorders while the front jacks allow you to copy the program to a third enregistreur. You can use two pairs of preamp outputs. On the front panel, again, two jacks for microphones Be a professional sound. Also easily thanks to Marantz Model 3600. A special conductor And this feature is Dolby. The Model 3800 is simply the most versatile preamp Marantz ever made. Never before, in fact, a machine has offered such a low distortion. On the output level of three volts, the model 3800 has a total harmonic distortion level of less than 0.02 % and 0.01 % by intermodulation distortion. We insist on the f act that these are maximum dimensions. In practice, the measured rates are even lower. The 3800 model is also a silencer device: it approach 1 dB, the theoretical maximum obtainable currently in ulilisation transistor circuitry. And as if that was not enough, this new model incorporates the more system for reducing noise in the most famous Industry Audio : Dolby system. Functioning as decoder with dolby sources, it can still act as a dynamic variable filter. This is a much better than traditional filter high (HI- filter) planing all the high frequencies at all levels device. Dolby NOTICE position can be used with all sources other than those with all sources ( other than those that have been dolby) in order to reduce noise such as tape hiss or "scratch" old discs and without significantly affecting the frequency response above 4 kHz. When dynamic passages fall too low, there is an increase in the high frequencies. This has resulted in a much better signal to noise ratio. All this actually constitutes a part of the characteristics of the 3800 model. with all controls sliders tone studs, the settings are immediate and precise bass, midrange and treble. Moreover, the tone settings can also operate from 250 Hz to 4 kHz, the choice for a better adaptation of the response sound to the acoustics of your listening room. the 3800 also has a monitoring circuit for two recorders. But entered as an additional front for copying from a third recorder. And this while listening to a program from another source. EQ switch lets you apply the tone controls for recording and compensate the deficiencies of the source to be saved. On the front panel again, two shots "microphone". All this is quickly said, the Marantz Model 3800 A new way to excel in the reproduction and recording sounds ! Input sensitivity and impedance 1,5v 47kΩ 1,5v 47kΩ 1,0v 47kΩ 1,0v 47kΩ 1,0v 47kΩ . Tone controls: Medium: 700 Hz . . ±6dB ±6dB . .
Output level: 3 volts 1 volts 1 volts 1,1 volts . .
Output Level Impedance: 600Ω 900Ω 900Ω 4,7KΩ . .
Total Harmonic Distortion: A power rating or below: 0.05% 0.1% 0.3% 0.3% . .
Intermodulation Distortion: A rated power or just below for any combination of two frequencies between 20 Hz and 20 KHz 0.05% 0.1% 0.3% 0.3% . .
You have several good reasons to choose the model 1200B. This is the most powerful existing preamps Built-amps. One that offers the most minimal sound distortion, its price, as its power litteralemenl are without competition. Greatly simplifying your choice. The specific power of the Marantz 1200B is 200 Watts continuous regime. In fact, it usually provides more than 230 Watts. But that's not all, the remarkably adaptable 1200B esl. You can connect stereo microphones, two turntables, a tuner and two auxiliary stereo sources, the two filters "High and Low" each have two cutoff frequencies. You really can have complete confidence in the 1200B: Total automatic protection of final output stage and speakers associated with it. In addition, Marantz exclusive; the "Variable Overlap Drive" automatically compensates the natural aging of the internal components of the power amplifier. Result: the 1200B still works "like new" independent professional slide potentiometers for tone controls for each channel. What the 1200B will always give you, it is a harmonic distortion and intermodulation less than 0.15%. Impressive, but less monumental, however, that the 1200B. Powerful enough however to "fill" musically whole house, 120 Watts of continuous power "usually 150" of 8 ohm speakers. Less than 0.2% total harmonic distortion and intermodulation. A type "computer" guarantees all the internal components of a functioning very accurately. Without distortion. without aging, with the fully automatic protection of the output stage. 1120 has inputs for microphones, platinum turntable, tuner, two tape recorders and an auxiliary source. An amp without rival in terms of price, performance, quality. An ambidextrous stereo Thus the music can be described as the 1070 model gives a stereo with a little extra: an atmosphere circuit, a synthesizer, achieving equivalent sound realism that given the quadraphonic. Filters "up" and "down" control the high and low frequency noises while 3 blocks cursors console allows separate settings for bass tones, medium and treble. Add to this the loudness under the extreme low frequencies. For amateurs, there outputs of preamplifiers and power amplifiers input. Each of these sections can be ulilis�e separately, the amplifier provides no fewer than 35 Watts RMS per channel at 8 ohms, from 20 to 20000 Hz with a maximum THD of 0.3%. Such a low rate, in practice even lower, is due to the fact that the amplifier circuits are directly coupled. The monitoring circuit can be connected to two recording devices to copy from one to the other. Whichever way you use it, you quickly concluerez the model 1070 is an amplifier designed by a professional. The Marantz 1060 has many qualities. For example, you can connect to virtually any type of speakers, even bulky. His power is sufficient to dominate the noise of the noisiest parties "Pop", 60 watts of impeccable musicianship. In fact, closer to 90 Watts r.m.s. than 60, strong or weak, whatever the intensity of the sound, distortion does not vary. Or rather, the lack of distortion. Less than 0.5% of harmonic and intermodulation distortion: usually 0.1%, the sound quality remains perfect at both ends of the audible spectrum. The filter "High" eliminates surface noise discs. The breath of the tapes, the filter (Low) removes stray background noise. You can easily select one of six sources of listening. Other benefits of the two recorders made for: jacks for stereo microphone on the faceplate, but the most attractive quality of a Marantz esl indescribable. We speak of its sound. Listen to the 1060 and judge for yourself. With the 1040, you will be filled: This is a true Marantz will make you make tough economies. It offers, in fact, no less than 20 Watts RMS per channel at 8 ohms, from 20 up to 20,000 Hz at a total harmonic distortion of 0.3% maximum, this being due to the fact that the circuits amplification, perfectly complementary, are directly coupled. The Marantz 1040 has a lot more things: a synthesizer, the room circuit, restoring the 4-channel effects, the high frequency noise filter, the Console 2 tone control sliders, 2 rear power outlets for the direct connection of auxiliary of your chain "tuner, turntable, for example", the monitoring circuit for 2 recorders running simultaneously or copied from one to the other You easily admit, it must be difficult to find another way to be perfectly happy with a purchase of this type there, model 1040. A small giant, its size small, very big on features. For if the 1030 is the cheapest of the Marantz amps it does not least built with all the technical meticulousness that makes a Marantz a Marantz rest. Of course, the 1030 is not as powerful or as sophisticated as other Marantz amps, but it has nothing to envy to other models on the value it offers for its price. Beyond 30 watts of continuous power, distortion: less than 0.5%. Possibility of recording control "Monitoring" and a microphone jack on the front panel. The output terminals for the speakers are instant fixation. Come also add tone controls Plots for easy identification of positions. The 1030 Marantz signed a marvel. Here′s another one to add to the program, the model 125 incorporates many of the features offered in the model 150. As the filter 18 linear phase poles with which you are guaranteed a level of harmonic and intermodulation distortion, among lower and a response well in phase, so the important thing for stereo and quadraphonic receptions. It also has an FM stereo decoder phase locked loop "PLL" which will ensure maximum channel separation with minimal distortion. The Model 125 has a Dolby FM-emphasis circuit, noted, even for the future, the output "FM quadraphonic" for connection to the appropriate decoder, when these emissions will fl & eacute; authorized. Meanwhile, there is still a lot of benefits you can already enjoy much more with the 125 model than any other device of this price. He became a legend in his lifetime. Incorporating the best features of the two most famous tuners already made by Marantz "models 10B and 120B" more allied to modern techniques some circuits belonging to the future ... The model 150: how the legend was created. To start we have incorporated is a linear-phase 18-pole filter. Developed by Marantz engineers, this linear phase circuit is an improvement of importance relative to conventional ceramic filters and crystal. It reduces phase distortion up to 15 times compared to the competition. With this, the harmonic and intermodulation distortion is also particularly reduced. Moreover, the identification of stations becomes very easy to make while sensitivity is significantly better. The Marantz 150 is equipped with an FM stereo decoder phase locked loop "PLL": precise stereo separation and minimal distortion in the reception. This technology is the result of research of the Apollo space program of NASA. This is therefore another example of special efforts made by Marantz to offer the latest and most proven techniques. But that's not all, we also maintained the traditional oscilloscope. He now has 8 cm and offers a set of incredible features: display of the dispersion of 4-channel sound allows, for example, to see the differences between the SQ and the CD-4, also what is possible centering sounds with "Dimension Control" display sound mode and 2-channel stereo separation; phase control in the reception of radio broadcasts. Also, as previously, it helps to know what is the intensity of a received signal or multi-path reception and operate the tuner to reduce distortion. Admittedly, (oscilloscope is much more convenient than a series of VU-meter. And now talking about an evolution of our system quadraphonic. The model 150 is already equipped with a special output for the addition of . FM decoder quadraphonic as for the stereo, it also has a special feature: a Switch "stereo only" makes it possible to capture the emissions stereo sound quality: the model 150 incorporates an FM Dolby-emphasis circuit. used in conjunction with Dolby external decoder All this without forgetting the usual features Marantz:... the control to tune gyro wheel, the circuit FM muting variable threshold mixer "HI-BLENO" for stereophonic emissions Quite simply, a the most sophisticated tuners at present. it is also MARANTZ, that says it all. An economic model that does not sacrifice the performance you expect from a Marantz. Of course it has the stereo FM decoder with locked phase loop (PLL) which you have heard about. It also has the Dolby FM de-emphasis Circuit, which, with the necessary decoder connected to the tuner outputs, will allow you to listen to radio broadcasts without any noise. Note the dual-function VU-meter, combined with the synthonisation gyro wheel, it allows the perfect centering of the desired emissions in FM and, in AM and to know the position that corresponds to the maximum reception intensity. After the Dolby, already mentioned let's talk about the future: a special output for FM quadraphonic to allow, after approval of the technical standards concerning it, to connect the appropriate decoder and to benefit from the sound comfort 4-channels. Now back to the model 112 itself: it does appears not obvious quibbles with such a set of advantages, it is not so economical. And yet just ask for its price, we really wanted it as well. We had the will to build a tuner, whose quality, at equal price, would be higher than that of our competitors. As for the price, we does not succeed: the Marantz 105-B is cheaper, which does not preclude having all the technical qualities of the other Marantz. And their high precision, all the essentials if there: tuning by high precision gyro-type tuning indicator double function allowing to indicate the optimum reception positions both in AM quibbles in FM. Use of FET and avant-garde transistors offering a long life without problems to your 105B. An AM ferrite antenna is incorporated as well as inputs for an AM/FM external antenna. The 105B also has a gold anodized front plate with push-button controls. Which makes a lot of extras. Extras that are standard, at Marantz. And that don't cost you one more franc. Input sensitivity and impedance 1,0v 100kΩ 1,0v 100kΩ 1,0v 100kΩ 1,0v 47kΩ . . Tone control: Medium: 700 Hz ±6dB ±6dB ±6dB ±6dB ±6dB . Output level: 1 volts 1 volts 1 volts 1 . .
Output Level Impedance: 900Ω 900Ω 900Ω 900Ω . . 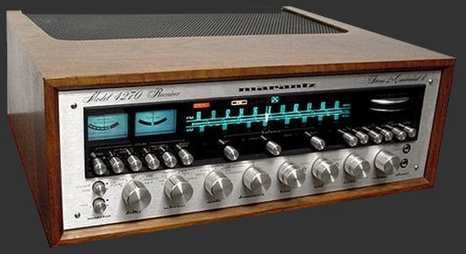 The 2325 model is the world's most formidable stereo receiver. And to say this is still far from the reality, both its advantages are numerous and its exceptional performances. Judge in, Dolby Circuit, noise reducer, stereo FM decoder with locked phase loop (PLL), variable threshold tone controls are associated with a formidable power of 125 watts RMS minimum, per channel, at 8 ohms between 20 and 20,000 Hz and without more than 0.15% Total Harmonic distortion (THO). A performance that only separate terminal amplification units can match. The Today integrated Dolby Circuit in Model 2325, which allows to decode or encode all possible sources, will still be in use in the future. Not only does variable dynamic filter, it can eliminate the blast of tape and the "Scratch" of old discs, but also, it will be able to receive future Dolby FM broadcasts. The Rusty worm phase loop decoder circuit ensures a stereo separation of at least 42 dB while maintaining the possible distortion at the lowest level. There is also a multi-path indicator for perfect antenna orientation. We told you, appreciate the features and the performance. We does really didn't exaggerate. The 2325 model is the most formidable of stereo receivers. Apart from the 2325 model. The 2270 if receiver proves to be, again, one of the most famous receivers on the market: 140 Watts RMS at 8 ohms from 20 Hz to 20 kHz with a distortion of less than 0.3%. Response curve � 0, 25db. Light indicator Instruments for antenna signal level, FM Channel central position and phase distortions. Special Circuit for noise suppression between stations and excellent reception of remote transmitters (Muting). The special specifications of this model 2230 allow to achieve higher performance than any receiver of a similar price. The continuous power is 60 Watts RMS at 8 ohms from 40 Hz to 20 kHz. The total harmonic distortion and intermodulation is less than 0.5%. The response curve: � 0.5 DB! Separate setting of the 2 channels for bass, midrange and treble. connections for recorder, turntable, earphones, quadraphonic adapter, etc... Fully automatic short-circuit protection device at the output of the loudspeakers. The traditional MARANTZ quality combined with high performance, make the 2220B receiver attractive and affordable. Extremely reliable, it delivers continuous power of 40 Watts RMS to 8-ohm loudspeakers, from 20 Hz to 20 ~ Hz with harmonic distortion and intermodulation less than 0.5%, an incredible response curve: � 1dB! The preamp section allows the connection of a turntable, a recording board, earphones, etc... and precision controls can change the sound of bass, midrange and treble according to personal tastes. Behind the gold anodized front plate, the presence of low-noise, low-distortion, FET transistors, heat sinks, automatic circuit protection and loudspeakers can be detected. The latest model of the Marantz Stereo receiver range is the 2015 model. This is proof that Marantz can build a competitively priced receiver without compromising the traditional Marantz quality. The model 2015 can provide continuous power of 30 Watts RMS to 8 ohm speakers from 15 Hz to 50 kHz, with harmonic distortion and intermodulation less than 0.9%, this model includes all the exceptional features of MARANTZ in a Restricted volume. Small and compact, it can be installed on a shelf or on a table. It allows the matching to: a recorder, turntable, auxiliary sources. In addition, it is equipped with quick-fix output terminals for main and additional loudspeakers. This precision device is also equipped with the tuning gyro for precise reception, a Muting push button that eliminates the inter-station blast when tuning. An AM ferrite antenna is also provided and the circuits are composed of avant-garde semiconductors, making the 2015 model one of the most beautiful stereophonic accomplishments in this price category. Passionate about music, you have often dreamed of an unparalleled sound. This is for you that Marantz is working. By pushing his search beyond. Beyond the current data of technology, power, design. To offer you what the future has of the best, from today. And that, only Marantz is able to do it. A Marantz doesn't get out of style. What for? Because the Marantz devices are equipped "and this is an exclusivity" of a special receptacle ready to receive a "SQ" decoder or does any technological innovation. It is therefore open to you to replace the decoder.., without buying a new channel. Another exclusive Marantz: the "Bridging circuit". This process offers more than double the power used in quadraphonic when the device is used in conventional stereo. And you does will never need, with a Marantz, to replace your entire collection of magnetic tapes or stereo discs. Indeed, in addition to the mono and stereo positions, the selector allows 3 other possibilities: "Discrete" for use with the CD-4 discrete disc Demodulator, "sq": for use with the sq plugged decoder, and "Vari-matrix", the "Vari-matrix" accentuates the relief on all Stereo programs. The live sound we've already talked about. Here's why. The DOLBY BREATH REDUCTION SYSTEM. The classic filters reduce the breath... but also, alas, fidelity. This does is not the case with Dolby, which eliminates noise and breath but leaves the sound intact. It also allows to record at reduced speed with highly satisfactory results. In particular, a clarity far superior to that which you gets by recording in 19 cm/sec without Dolby. For FM broadcasts, the Dolby system removes some interference and breath with unparalleled efficiency. The Dolby does system is more of a luxury. It tends to be adopted by all sound specialists. But Marantz has adopted Dolby where it will make you the greatest services. 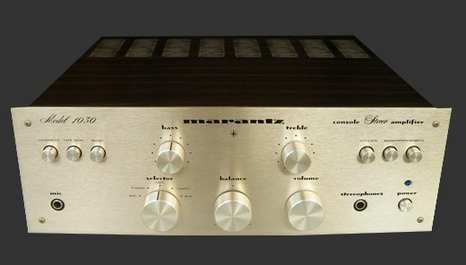 In 6 amplifiers el a Marantz preamplifier. Nothing limits you in your choice of tapes and tapes. You does have more to acquire an additional system, expensive, cumbersome... and a problematic efficiency. Thanks to its flexibility, the Dolby system can if adapt to tomorrow's technology without any problem. Which is good in the tradition of Marantz. Tone Control: Medium: 700 HZ ±6dB ±6dB ±6dB . .
Niveau de sortie: 1 volts 1 volts 1 volts . .
Output Level Impedance: 900Ω 900Ω 900Ω . .
More than 100 watts per channel in stereo, more than 40 watts per channel in quadraphonic, and all distortions by intermodulation or harmonics well below 0.15% from 20 Hz to 20 kHz. The 4300 is equipped with a Dolby "B" circuit suitable for recording and playback of does any recorder. It also allows to decode FM broadcasts in Dolby B system is studied in anticipation of future developments in this field. A locked phase Loop Multiplex Stereo decoder provides maximum crosstalk and minimal distortion on FM stereo station. A quadradial output is inslall�e on the rear side of the device in anticipation of future �misslons in 4 channels. The tuner/preamplifier section is separated from the power amplifier, allowing the 4300 model to be utlliser with additional power amplifiers. It is possible �galemenl to control the recording on 2 4-channel recorders and also to exert copies of one on the other. The 4300 can also be remotely controlled, which allows you to set the device from where you listen. Marantz presents the most powerful receiver in the world. Whether in stereo or quadraphonic, the 4400 is actually the most powerful receiver currently; A total power of 250 watts, 125 watts RMS per channel in stereo and more than 50 watts RMS per channel in quadraphonic mode. A refined pleasure for the eyes and ears the eye of this dynamic receiver is actually its built-in oscilloscope. It helps you to lose nothing of the revised FM signal so that your reception and your listening comfort are as close to perfection as possible: it indicates the maximum size of the signal received on the antenna and the minimal phase distortion, this device does was not p Tulsa and reviewed only for stereo, but also for displaying the dispersion of sounds in 4-channel mode when modificafions is performed on balance controls or mode selector. Thus you will be able to see how the image of your stereo program changes when you "Quadriphonisez" it using the "Vari-MATRIX DIMENSION" control which will give you a striking quadraphonic effect. Remember that the oscilloscope allows the stereo separation of the received FM broadcast to be displayed, as well as the accuracy of the phase of the same FM signal. As you can see, you benefit from a visual indicator that cannot be replaced by a multitude of other dials. The ear is demanding also was added another "extra" to 4400: Dolby. Designed in an expressly unusual way, this circuit decreases the unwanted background noise, without reducing the dynamics of the music involved. Dolby makes listening more enjoyable, removing from your mind the doubt of residual noise. Also because quibbles it has been redesigned according to its future uses as well as for the current FM and magnetic tapes. But there is even more the 4400 can be remotely controlled in such a way that, without leaving the listening location, the music can be exactly localized and amplified at will. The 4400 incorporates a locked phase lock loop Stereo decoder that increases the crosstalk and distortion of FM stereo programming. Originally the lock Loop Phase had been developed for NASA's space communications. This does is quibbles an example of the continuity of Marantz's efforts to provide space-age technology. The 4400 offers further advantages, such as 2 "tape monitors" for copying on two quadraphonic recorders, tuning "Gyro-Touch" for immediate and accurate selection of stations, a "MULLNG" switch that reduces the noise of FM background on weak stations without affecting the quality of the crosstalk or the frequency response of the music. The "muting" or silent chord with variable threshold allows to eliminate inter-station noises when they are selected or to receive weak stations that would normally have been muffled. Now put all these features in a single receiver, and you understand why the 4400 model is exceptional, when we thought about it and we built the most powerful receiver in the world, we were looking to fulfill your wishes The craziest. Marantz Model 4400. This is a highly desirable Marantz. For several reasons, the first of which is that Dolby Circuit incorporated. The breath reducer par excellence, usable with magnetic tapes, FM... as well as the discoveries of the future, the 4-channel balance controls allow you to shade the music according to your preferences. The locked phase-loop multiplex decoder guarantees a very accurate stereo separation and minimal distortion for FM stereo programming. And for the reception to be even more accurate, the 4270 is equipped with a Tuning gyro steering wheel and two vu-meters. When you use the 4270 as a stereo receiver, you have more than 70 watts of continuous power per channel or 25 watts per channel in Quadraphonic. The unrivalled quadraphonic Marantz. Distortion (THD and IM): less than 0.3%. Further refinement: An output allowing the connection of a remote control. Perfection in Ouadriphonie. What goes almost without saying when it if is a Marantz. More than 30 watts of continuous power per channel for stereo and more than 12 watts per channel in Quadraphonic. Power, performance, Price: Everything quibbles it takes to seduce you. And of course you benefit from the Dolby "blast reducer" circuit and a 4-channel balance control as well as the tuning gyro steering wheel and 2 vu-meters for very precise tuning of FM broadcasts. The does remote control system was not forgotten either. 2 recorders can be connected to the 4230. And in addition to the superb sound that you are entitled to expect from a Marantz, the device is equipped with a physiological corrector "loudness" and an acute filter "Hi-Filter". For its price, the 4230 is unbeatable. Preamplifier-Phono Section: Dynamic: ratio of the maximum voltage before saturation to the equivalent noise: 96 dB 96 dB . Equivalent noise level: 1,9 uV 1,9 uV . Sensitivity and impedance 1,80 mV 47KΩ 1,80 mV 47KΩ . Tone Control: Medium: 700 Hz ±6db . .
Exteriorly, the 4140 model is sleek and functional. The interior is even more wonderful. All the power you want to hold is at your disposal, you can use it in stereo, it will provide more than 70 Watts per channel. If you invert the Power Boost mode button to enjoy the quadraphonic effect, it will provide more than 25 Watts per channel. The "Vari-Matrix" Circuit and its dimension control are incorporated as well as the possibilities for future adaptation. The 4-channel balance control offers a variety of moves from the main listening area, where you want to listen. The appliance is equipped with numerous input and output sockets at the rear of the appliance, allowing the connection of: Occilloscope to 4 tra�es, 2 recorders, pre-amplifier outputs and independent power amplifier inputs. The gold anodized front plate and bright black-bottomed dials have excellent contrast and give the 4140 an extremely sophisticated appearance. Pleasant surprise, the 4070 costs less even than the 4140. Surprise, because the 4070 is equipped with the "Vari-Matrix", the dimension control, the 4 channel balance controls. The Mode button offers 5 selections (mono, 2 channels, discreet, SQ decoder, Vari-Matrix). To listen to your stereo discs like you've never done before. But back to power, the 4070 offers you more than 35 watts per channel in stereo and more than 15 watts per channel in Quadraphonic. Enough to make the house of a music lover from the cellar to the attic vibrate. The Marantz 4070 much more.. For a lot cheaper. Which is always good to take. And when it if is a Marantz to hear. Many music lovers want to own the quadraphonic but do not want to get away from the stereo elements quibbles they have already acquired. For them, Marantz created the model 4000. By adding the 4000 model to your current installation, quibbles a stereo power amp and 2 speakers, you get a high-class quadraphonic installation. And you also benefit from a much larger number of quibbles controls and enhancements with a simple 4-channel receiver. The 4000 is your control center for volume, scale, "mode".. And also provides full control of the rear channels. And the controls of your existing installation remain fully operational. With the 4000, you enjoy all the "extras" Marantz; Vari-Matrix, scale control, bass and treble filters, 4 vu-meters and remote control system. The 4000, an efficiency, a very Marantz elegance.